Guest soaps are expensive, and regular bars of soap aren't very pretty. 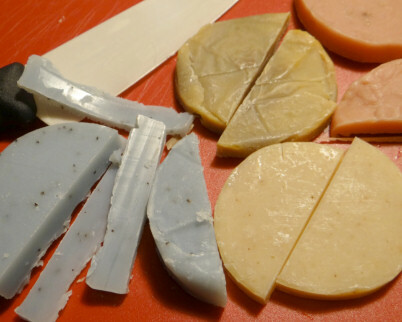 Here's a really easy way to make guest soaps on a budget. Regular guest soaps also don't look very nice after they've been used a few times. The soap I used is a locally made soap. A lot of times soapmakers will sell "end cuts" which are cuts that aren't as pretty. The ones used were round. So to start, I cut them half. 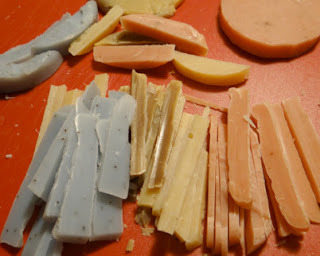 End cuts will usually include several kinds of soap in different colors which look wonderful together. Then it's just as easy as slicing off thin pieces. I liked my ceramic knife for this because it's the sharpest knife I have. You don't want them so thin they curl, but you do want them small. I found that cutting straight through with a sharp knife was neatest for the soap I used. That means putting the knife on top of the soap and pushing it through, with harder soaps, slicing might easier. This is what the looked like after they were all cut. The ends that weren't sliced are going to be used in the kitchen for hand washing by my family. Arrange them in a demitasse cup or a tea cup for an extra bit of fun. If you're using regular rectangle bars of soap, you can cut them in half lengthwise, then make little squarish shapes and pile them on a dessert plate. This will also work beautifully with glycerin soaps. I like the Kleenex Hand Towels for guests because it's a nice clean option instead of shared guest towels. The box can be stood up so the towels come out of the top or laid down as shown in the photo above. They also can be decorated easily with paper or even just wrapped in an embroidered cloth hand towel to fit your decorating scheme. Join the 14 million people who have already joined the Clean Hands campaign by using Kleenex Hand Towels, and click here for savings and more! I was selected for participation in this campaign as a member of Clever Girls Collective. I got my new glasses! 2 printable boxes- one in color and one to color!